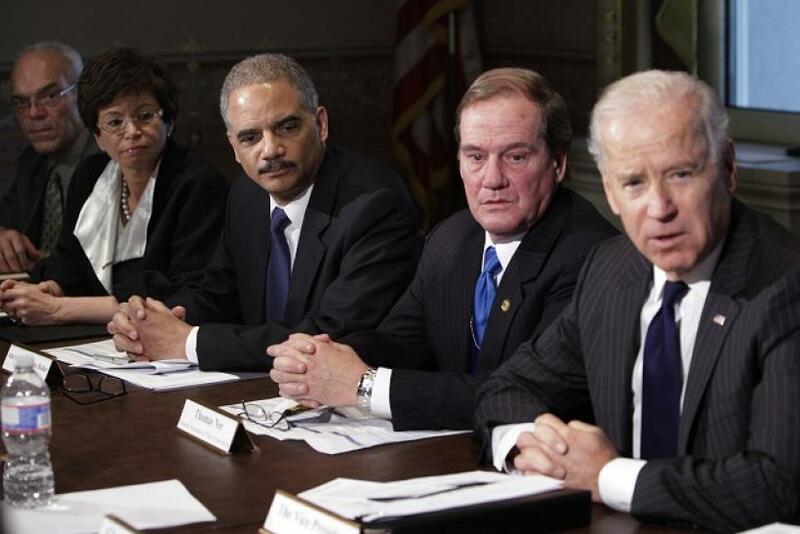 Vice President Joe Biden, far right, sits with other officials, including Attorney General Eric Holder, center, at Thursday's public policy meeting on guns. The latest school shooting in the United States happened Thursday at Taft High School in Taft, Kern County, Calif. Two people have been shot, and the shooter is in custody, according to a tweet by TV station KABC in Los Angeles at 9:32 a.m. local time. The news came just as Vice President Joe Biden was convening a meeting at the White House with the National Rifle Association and other gun-advocacy groups, as well as with Wal-Mart (NYSE:WMT), one of the biggest gun sellers in America, on ways to curb gun violence. Biden heads a task force assigned by President Barack Obama to come up with measures to reduce gun violence in America in the wake of the Newtown school shooting last month in Connecticut, which killed 26 people, including 20 small children. In another grim coincidence, the news broke just as the White House sent out to subscribers an email with the subject line "Working Together To Prevent Gun Violence," which contained a picture of Attorney General Eric Holder and Biden at the meeting. According to a report in Politico, Biden said on Thursday that the panel he leads will deliver recommendations to President Obama by next Tuesday. "I have a very tight window to do this," Biden said at the beginning of the meeting. "The public wants us to act."